“The health of our students is an utmost priority, and the McDonald Center will enable us to more effectively and comprehensively support their mental and other health needs,” said Rev. John I. Jenkins, C.S.C., Notre Dame’s president. “I am grateful to Lise and Mark for their extraordinary generosity and their decision to honor my brother in Holy Cross, Father Jim McDonald." The McDonald Center for Student Well-Being provides prevention, intervention, and education programs and coordinates assessment activities that support the health of Notre Dame students both at the center and across campus. It embraces the University’s aspiration as a Holy Cross institution to educate the whole person, providing services that reinforce an integrated approach to wellness, encourage individual student engagement and foster a caring and informed campus community. Father McDonald currently serves as assistant provincial and steward for the U.S. Province of the Congregation of Holy Cross, Notre Dame’s founding religious community. His previous assignments include service as an associate vice president and counselor to Father Jenkins, and rector (headmaster) of Saint George’s College in Santiago, Chile. “I am deeply humbled and grateful to Lise and Mark for their generosity in this area of critical need and benefit to our students,” Father McDonald said. “For personal and professional reasons, I am honored to have my name, my religious life as a Holy Cross priest, and the long, deep and joyful friendship with the Galloglys and Stricklers associated with this new center. Gallogly earned his bachelor’s degree from Notre Dame and a master’s of business administration degree from Columbia Business School. He is the co-founder and managing principal of Centerbridge Partners, an investment firm that focuses on private equity and credit investing. Prior to founding Centerbridge in 2005, Gallogly worked for 16 years with the Blackstone Group, where he was most recently a senior managing director and head of private equity and a member of the firm’s management committee. He has served on numerous boards, including President Barack Obama’s Council on Jobs and Competitiveness (2010-2012) and his Economic Recovery Advisory Board (2008-2010). Mr. Gallogly currently serves on the advisory council of the Hamilton Project, an economic policy group at the Brookings Institution; Columbia Business School’s board of overseers; and the board of trustees at ROADS Charter High Schools. He is a member of the board of directors of the Partnership for New York City, a trustee of the Economic Club of New York, and a member of the Council on Foreign Relations. Strickler earned her bachelor’s degree from Yale University and a master’s of business administration degree from Columbia Business School. After graduating from business school, where she and Mark met, she worked as director of investor relations for TriStar and Columbia Pictures. Strickler now devotes most of her time to the public interest, focusing mainly on education and the environment. She is a member of the board of directors of Environmental Advocates of New York and serves on the advisory board of Columbia Business School’s Social Enterprise Program. She recently was appointed co-chair of the Yale Development Council. 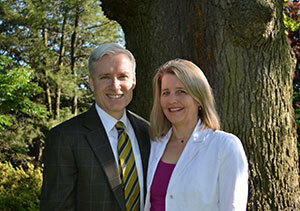 Previous gifts to Notre Dame from Gallogly and Strickler include support of the Stephen Rogers Endowment for Graduate School Studies, The Malpass Scholars Program and Contending Modernities, a project that seeks to generate new knowledge and greater understanding of the ways in which religious and secular forces interact in the modern world and to advance collaboration for the common good. Gallogly and Strickler are the parents of three daughters, Katharine, Grace (Father McDonald’s goddaughter) and Nell. Originally published by Dennis Brown at news.nd.edu on September 15, 2014.